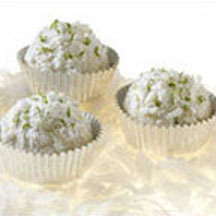 Lime and coconut add a delightful flavor twist to a traditional butter cookie. Preheat oven to 350ºF (175ºC) with racks in the lower and upper thirds. Combine butter and sugar in a bowl. Using an electric mixer or wooden spoon, beat until light and fluffy. Add lime oil; beat to combine. Gently fold in lime zest, salt, flour and coconut. Blend well. Lightly flour hands and roll dough into small, approximately 1-inch balls and place about 1 1/2 inches apart on an ungreased baking sheet. Bake until puffy (not browned) and bottoms are just golden, about 15 minutes. Allow cookies to cool on baking sheets for about 5 minutes. Meanwhile, combine coating ingredients in a quart or gallon size plastic bag. While cookies are still warm, toss them in the coating. Remove and transfer to wire rack to cool completely. Makes about 2 1/2 to 3 dozen. *Pure lime oil is available in many specialty food stores. Alternatively, use 2 tablespoons fresh lime juice. **Unsweetened coconut can be found at many specialty and health food stores. Look for medium shred.